“On nearly all photographs something is depicted. A lot can be said about that something on or in a photo. One cannot be oblivious about that. However, the photo by itself is also something, a physical object with tactile qualities, which can come to life in a space. Next to the traditional idea of the photo as means of representation, it can also – as an object – become part of a plastic presentation. The exhibition A Group Show focuses on an alternative approach to the photographic object. It emphasizes the way images are being incorporated by artists, and how photography is used in an (often associative) game of construction and deconstruction of the medium itself. The exposition wishes to accentuate the material and spatial features of the image instead of its representational values. It brings together people with an investigating attitude towards the medium photography and creates a context in which there’s plenty of room for discussion and experiment. 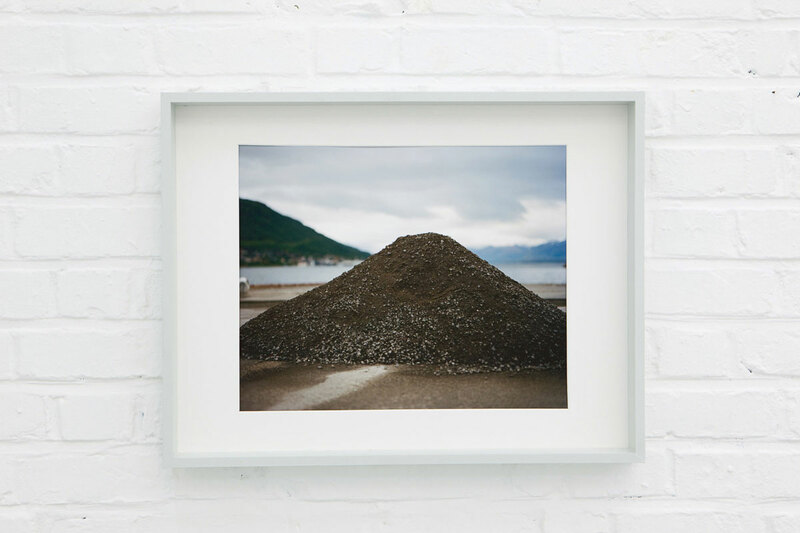 For ‘a group show’ in Gent I combined the “Borderline Picturesque & the Recounting Prospect” sound work together with a pile of washed and oiled basalt chips and an image of a pile of gravel framed centrally within a distant valley. 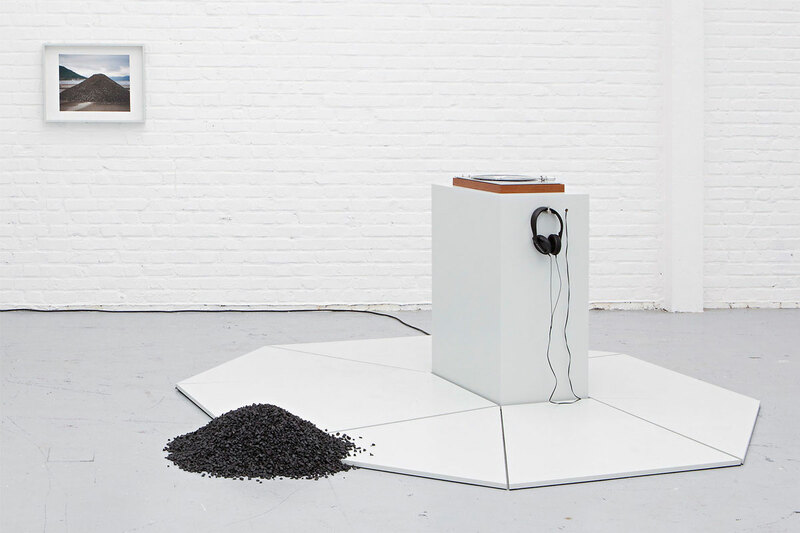 For this work I build a platform on which you would stand while listening to the record. The platform is octagonal and it’s design is intended to relate abstractly to bandstand architecture emphasising the musical or oral history associations in the sound work. 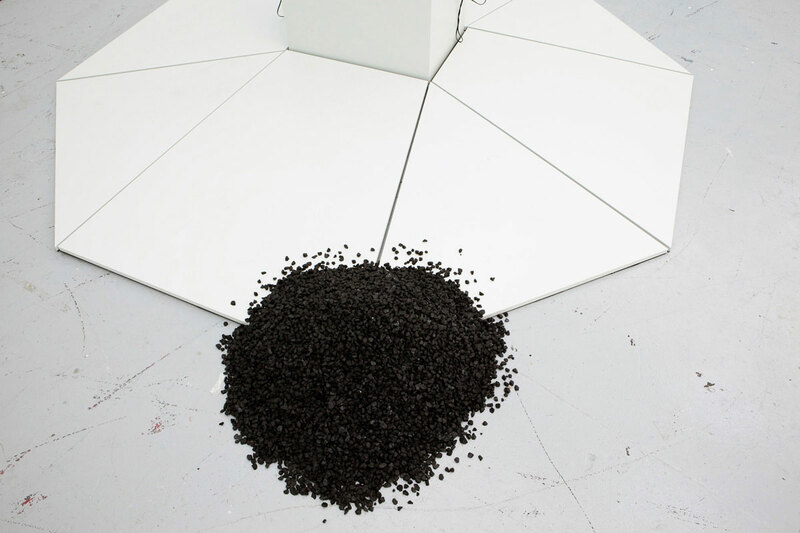 ”Borderline Picturesque & the Recounting Prospect” is a work that explores notions of landscape, specifically in their relation to cultural formation. Over the last two years I repeatedly spent periods in Tromsø, Norway, where a resurgence in the appreciation of local identity both fascinated and bewildered me. The resulting works go beyond specific local politics, probing into the desires behind cultures’ relation to landscape. A sound work addresses the desire and myths of exploring a foreign and forbidding landscape. I had images from Norwegian Polar Research Centre translated into text by a professional who usually works transcribing films for the blind. Download A Group Show in PDF.